That isn't because I'm at all unhappy with it, I promise you. On the contrary, I love the darn thing to death. In fact, it's possible I love it too much. What do I mean by that? 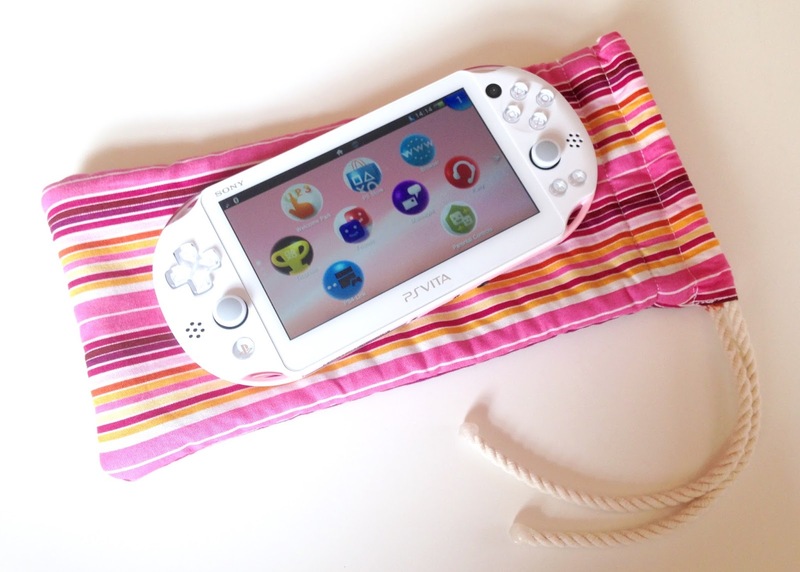 Well, as I've stated elsewhere a few times before, I'm so used to laptop-esque handhelds like the 3DS, DS and even the GameBoy Advance SP that a system with an exposed screen like the Vita kind of freaks me out--to the point that I keep mine wrapped up and in its box whenever I'm not playing it. As you probably can imagine, keeping a handheld stowed away in its original packaging doesn't exactly promote regular play--which should help explain my lack of experience with the Vita so far. That's all in the past now, though, thanks to the snazzy, padded carrying pouch my neighbor friend, Gina Gallaway (her husband is Brad Gallaway, managing editor of GameCritics.com), recently made for me. 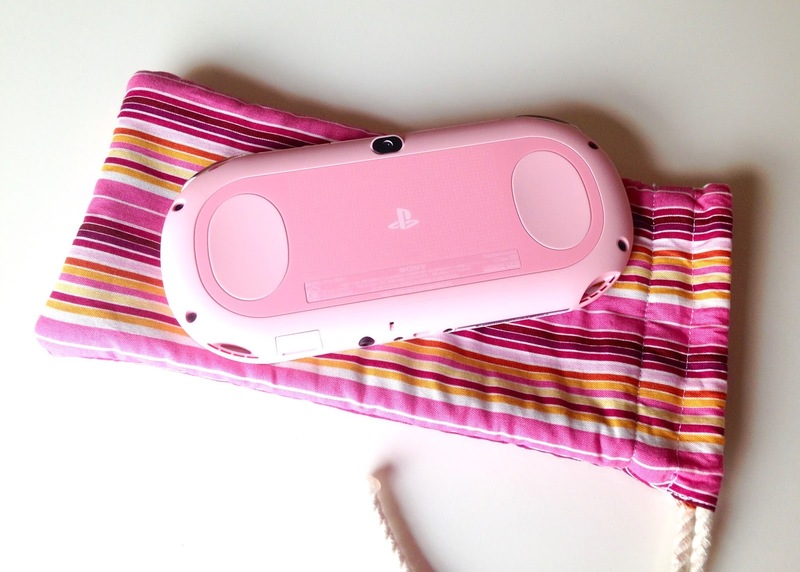 As you can see in the photo below, it beautifully complements my oh-so-precious Vita. Anyway, now that I have a case (or pouch, or whatever you want to call it) that can protect my Vita from dust and scratches and other such things, I'm keeping it at the ready. Which means, of course, that I should be able to put a good amount of time into the copy of Curses 'N Chaos that the folks at Tribute Games kindly sent to me a week or two ago. That's not to say I haven't put any time into it yet. 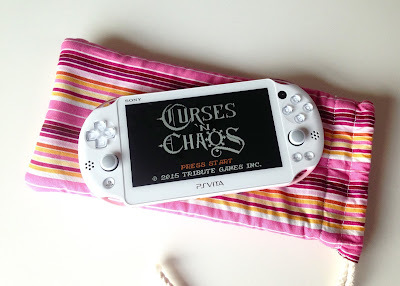 Actually, I put about an hour into Curses 'N Chaos last weekend, but I'm not sure that was enough for me to come to any solid conclusions about it. As for my not-so-solid conclusions: well, based on what I've seen and heard and felt so far, I've got to say I'm a bit surprised--and I don't mean that in the best of ways. Don't get me wrong, Curses 'N Chaos both looks and sounds wonderful--as is the case for every Tribute Games release I've encountered to date. It feels good, too, truth be told. As of now, though, I'm not sure I'd say I'm finding it all that fun. You see, I came into Curses 'N Chaos expecting that it would be some sort of Ghosts 'n Goblins or Ghouls 'n Ghosts clone. While it Tribute Games' effort ably apes the aesthetics of those Capcom classics, its gameplay is a lot more limited. Specifically, while the aforementioned quarter-munchers have sprawling, side-scrolling levels, all of the ones included in Curses 'N Chaos are single-screen affairs. Because of that, Curses 'N Chaos is more of a "score attack" sort of game. That's all well and good, but I'm not really a "score attack" kind of guy. So, for the moment I'm not exactly feeling this digital title (which can be played by PS4 owners, too). I'm not giving up on it, though--not by a long shot--so look for me to share additional impressions on it in a future post. Have any of you played Curses 'N Chaos? If so, what do you think of it?